I love the feeling I get when I look at this little jumbled corner of one of my bookshelves. Maybe it's the sense of possibility or anticipation that comes when one sees ribbons and wrapping paper. I took the photo earlier this summer when I was painting my office. I just stuck things in corners every-which-a-way but I was struck at the way it jumbled together in a nice kind of way. I like the way the sun light from the window creates a bit of contrast of light and shadow. 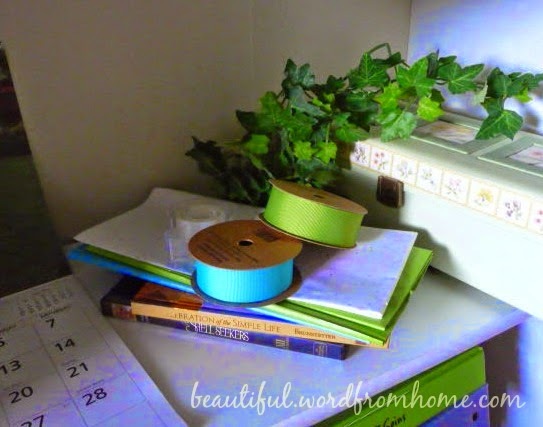 And I do know that I absolutely enjoy the grosgrain ribbons in these delightful colours. Notice the tissue paper underneath. And there's the longish box in soft green which holds the tiniest cards for adding atop a gift. Now... for those of you wondering about the titles under the tissue paper (I know you're squinting to see what they are). Both are gifts for my mom on Mother's Day... a delightful little book called A Celebration of the Simple Life by Wanda Brunstetter and the DVD of the wonderful old movie The Shell Seekers, a favourite for us both. 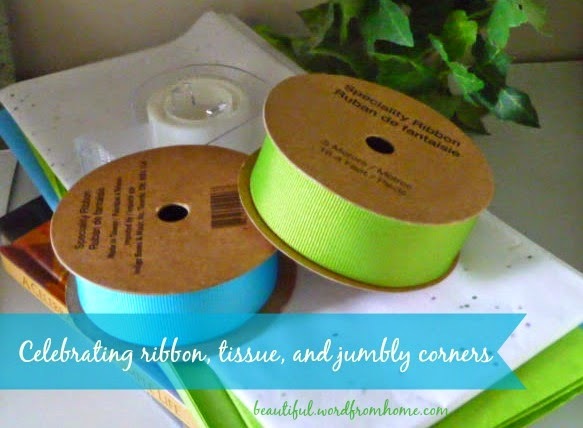 And so here's my little post that celebrates ribbon, jumbly corners, and the joy of giving packages wrapped up in tissue and ribbon. If you think this might be a little too frivolous for these troubled times, remember C.S. Lewis once said that joy is the serious business of heaven. And I decided a long time ago that I would live a little 'heaven on earth' right here, right now in the midst of the ugly... to recognize beauty in all its forms and celebrate them. Maybe it's a small way ... a small wave ... that changes the atmosphere. Refusing to let the ugly have the upper hand. Even with ribbons. I love ribbons, they make it so easy to add a splash of joyful color to all kinds of things including, of course, those tantalizing packages! What a beautiful package, Brenda! 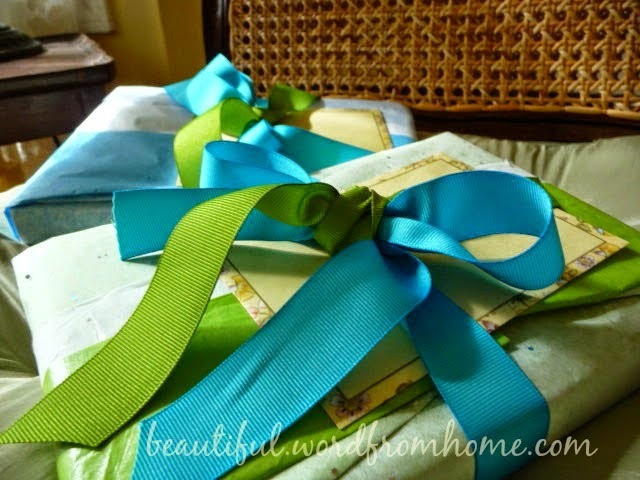 I love grosgrain ribbon, beautiful packages...and joy-filled touches among the ugly! Have a joy filled day!! We need all of the beauty. Thank you for sharing so generously yours! I forgot that quote - but I must bring it back into the front of my mind, because oh, don't we need it in these days of terror and suffering. Of course, they have always been around, but people didn't have to be up-to-date about the pain in every corner of the world. "Pray for all men everywhere" must have had a somewhat different meaning when the apostle wrote it. And I love the colors of those ribbons! Beauty everywhere, even in small corners. I love this. And I didn't know that The Shell Seekers was made into a movie. It's one of my favourite Rosamunde Pilcher books. Beauty is healing, beauty is comforting. We need to be concerned and pray and do what we can, but oftentimes I think that being a light right where we are and creating/sharing beauty right where we are can really be considered a form of warfare against evil. Fight the good fight!